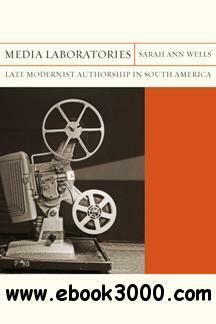 Media Laboratories explores a pivotal time for South American literature of the 1930s and '40s. Cinema, radio, and the typewriter, once seen as promising catalysts for new kinds of writing, began to be challenged by authors, workers, and the public. What happens when media no longer seem novel and potentially democratic but rather consolidated and dominant? Moving among authors from Brazil, Argentina, and Uruguay, and among the genres of fiction, the essay, popular journalism, and experimental little magazines, Sarah Ann Wells shows how writers on the periphery of global modernity were fashioning alternative approaches to these media. Analyzing authors such as Clarice Lispector, Jorge Luis Borges, and Felisberto Hernandez, along with their lesser-known contemporaries, Media Laboratories casts a wide net: from spectators of Hollywood and Soviet montage films, to inventors of imaginary media, to proletarian typists who embodied the machine-human encounters of the period. The text navigates contemporary scholarly and popular debates about the relationship of literature to technological innovation, media archaeology, sound studies, populism, and global modernisms. Ultimately, Wells underscores a question that remains relevant: what possibilities emerge when the enthusiasm for new media has been replaced by anxiety over their potentially pernicious effects in a globalizing, yet vastly unequal, world?